Traveling the world, it is not uncommon to meet groups of people, who carry secret ingredients in their diets – giving them health, longevity, and strength. 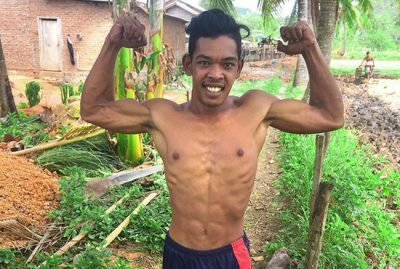 One secret to health, especially when it comes to physical strength and body building, comes from the island of Lombok in Indonesia. There, in a place where there are no gyms or fitness centers, live the people called Sasaks. These natives have naturally toned and muscular bodies. 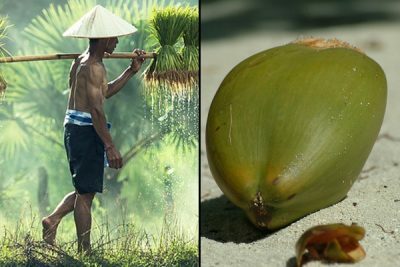 Besides some being involved in traditional Sasak stick fighting called Peresean and many people using their physical strength to farm every day, scientists have pointed out a food item that helps Sasak people build muscle without consciously making it their goal. This food is familiar to many of us – coconut. But it is the amount it is used in Lombok that makes the difference. To explain what role coconuts played in the diet and lifestyle of Sasaks, a young men named Aziz allowed a visitor from Playground to stay with him for a few days. Aziz lives in one of the small villages of Lombok with his family. His family life is simple: most of them farm in the rice fields, working about 3-4 hours a day. The rest of the day they spend together as a family and with neighbors by the sea. The word “stress” is not in their vocabulary. “We eat, our children go to school and sometimes we can afford the occasional treat,” Aziz said. Three times a day, Sasaks eat small, nutritious, and very spicy meals often including rice, and they drink coffee before each meal to suppress appetite. In between the meals, they snack on papayas and bananas. Most people are very healthy and do not know what cancer is. (The World Health Organization collected data from Indonesia in 2016, and the incidence of cancer was 133 cases per 100,000; in the U.S. this number is much higher – 455 per 100,000). When it comes to overall health, Aziz says that coconuts are the healthiest food they have. Every day he swiftly climbs about five 50-feet tall coconut trees, while barefoot with a machete in his hand, to harvest coconuts for his family. Eating coconuts for Sasaks is part of their traditional diet, and they probably never studied why coconuts are good for you. But in western medicine, scientists have provided many clues as to why coconuts are not only healthy, but important for building a strong body. In 2016, Korea Food Research Institute studied the diet of the Sasak people, and confirmed their high coconut consumption. Sasaks often add grated coconut on top of many dishes such as sweet rice patties, and coconut milk is used in meals and as a snack. Out of 151 meals the researchers studied, coconuts or Cocos nucifera were reportedly used the most times out of 111 plants total – coconuts were used in 85 meals. They also carried the highest traditional social and cultural value. Coconuts are full of nutrients, and the parts that are used for health and culinary purposes are: coconut milk – liquid stores inside mature coconut meat, and coconut water – liquid inside a fresh coconut, and coconut meat itself. Coconut oil, the most commonly used item around the world, is a product derived from the meat of mature coconuts and while it is processed naturally, it is still a processed food item. All three parts of coconuts – meat, water, and milk – can be a great dietary addition to a fitness regimen, as well as over well-being. Here’s why. Coconut milk is high in healthy saturated fatty acids, 50% of which is the beneficial lauric acid, and it is great for energy. Even though it contains saturated fat, coconut milk is known to improve cholesterol levels, blood pressure, and cardiovascular problems, not cause them like other fatty foods. It’s also a good source of manganese and a few other minerals. When it comes to building muscle, coconut milk provides electrolytes needed for the muscles to repair any damage and grow, while also preventing dehydration and giving the person a lot of energy from medium-chain triglycerides (MCT) fatty acids. Coconut milk is also considered a fat-burning food. It is great for weight loss – prevents overeating and helps to burn fat. Coconut milk recommended serving is at about ¼-1/2 cup, because of its high calorie content. When choosing which coconut milk to buy, Dr. Josh Axe recommends any organic coconut milk that was “cold pressed,” unsweetened, is free of preservatives, and was not pasteurized as that kills some nutrients. If you buy it in a can, make sure the can is BPA-free. Coconut water is high is electrolytes, especially the essential sodium, magnesium, potassium, calcium, and phosphorous. Unlike coconut milk, it is fat-free and cholesterol-free, while also a low-calorie drink. If you want to use coconut for re-hydration while avoiding the calories, coconut water is the way to go. Coconut meat is where the most nutrients are found. It has 17 amino acids, which support formation of collagen in the body, while protecting the heart, the liver, and central nervous system. It helps muscle growth by building connective tissues and promoting elasticity in the body. Just like coconut milk, coconut meat is great for weight loss. It is especially beneficial for reducing body fat in the abdomen area. At the same time it speeds up metabolism, making the body burn calories faster. Whether it is for weight loss, muscle growth, or general health, coconuts both mature and young, are a versatile addition to any diet.